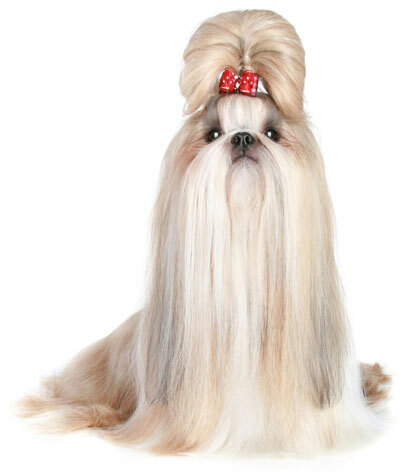 The Shih Tzu is a loving, friendly, gentle, playful, loyal and happy dog. He loves people and bonds with the entire family. He needs to give and receive a great deal of love and affection, and is not the kind of dog who can be left alone inside the house for many hours at a time, or kept outside in a yard. He is an indoor dog who needs to be petted, held, cuddled and pampered, and he is happiest napping on the couch with you for hours. Although he is generally a docile, quiet lapdog, he can also be lively, energetic, independent and spunky. He's an outgoing and fun companion who loves to roll and play on the carpet with his squeaky toys, or romp outdoors in a safely enclosed area. He needs minimal exercise, but he does enjoy a daily, leashed walk. He loves to go everywhere with you, and even traveling in the car, but he shouldn't travel or be outside in the heat, as he is very sensitive to warm temperatures. He is a sweet, rarely aggressive dog who gets along well with strangers and other pets and makes friends wherever he visits. He does very well with considerate, older children, but he may be jealous, snappish, or fearful of younger, rougher toddlers. He is an excellent watchdog since he barks very loudly at strange noises and people--but then will quickly make friends if you accept the newcomer. He is not an easy dog to train and is difficult to housebreak. He is so gentle he doesn't need a great deal of training, but he can be proud and stubborn, and does not respond well to harsh methods. You will need to be very patient and consistent to train him. While he needs plenty of attention, you must also be careful not to spoil him, or he will grow jealous. You must be careful not to overfeed him, as he can easily become overweight. He may snort, sneeze, and wheeze, and with his flat face can sometimes injure his eyes. He is a very low shedder, so he is a good pet if you don't want dog-hair in the home. The Shih Tzu is 8 to 11 inches tall (to shoulders) and weighs 9 to 16 pounds. He has a double coat consisting of a long, flowing, soft and straight outer coat and a soft, thick undercoat. His coat can be solid, two-colored, or tri-colored, and may contain white, black, blue, brindle, gold or red. Pet coat: His coat only needs to be brushed occasionally and clipped short every few months. Show coat: Brushed for 10 to 15 minutes daily to prevent matting and tangling, and trimmed every six weeks. The Shih Tzu, whose name means "Lion Dog" in Chinese, can be traced back to images and paintings that date to the 7th century. He is descended from the oldest and smallest of Tibetan holy dogs, and was a favored court dog during the Ming Dynasty. In 1908 the first Shih Tzu arrived in Europe, and the Shih Tzu Club of England was established in 1935. During the Communist Revolution in China the breed nearly died out, but Shih Tzu living abroad were used to rebuild the breed, and he is now one of the most familiar and beloved dogs in the world. His AKC popularity was 9th out of 157 breeds in 2007.